FILE - People chant against the government during a protest in Kordofan, Sudan, Dec. 23, 2018. With violent anti-government protests into their fourth week, Sudan appears headed toward political paralysis. As violent anti-government protests enter their fourth week, Sudan appears headed toward political paralysis, with drawn-out unrest across much of the country and a fractured opposition without a clear idea of what to do if their wish to see the country’s leader of 29 years go comes true. People run as tear gas canisters are thrown at them during an anti-government protest in Omdurman, Sudan, Jan. 9, 2019, in this still image taken from social media. 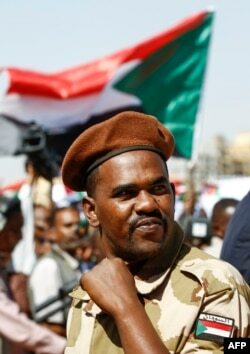 A member of the Sudanese security forces attends a rally for the supporters of President Omar al-Bashir in the Green Square in the capital Khartoum, Jan. 9, 2019. 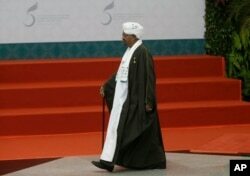 FILE - Sudan's President Omar al Bashir walks to the stage before a group photo session at the Organization of Islamic Cooperation summit in Jakarta, Indonesia, March 7, 2016. “There is no doubt that there will be big changes as a result of these protests, but they will never be of the magnitude that Sudan needs, “ said another activist, who also did not want to be named.